Black Rat Press is delighted to be publishing the latest edition from Nick Walker’s Morning After Series. TMA Moscow is a 16 colour hand pulled screenprint and is our favourite TMA print to date. From past releases we know that the demand for this series of prints is extremely high and that whichever way we release it some people will be disappointed. Nick has decided, and we agree, that the fairest way to do this release is via a lottery style system. This allows for people in different parts of the world and those not available to queue or be near a computer at a specific time to have an equal chance. Winners will be picked at random and receive an email offering them the opportunity to buy a print. If anyone decides not to take the print or does not reply within 24 hours of us sending the email offer we will draw another name at random. 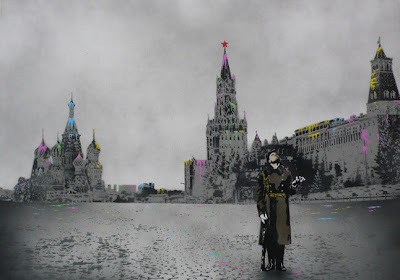 TMA Moscow will be a 16 colour screenprint, signed and numbered from the edition of 150. The price will be £550. To enter the lottery please email in with the subject TMA Moscow Lottery and your name and address to info@blackratpress.com The draw will take place on November 11th and winners will be notified the same day.Good luck!